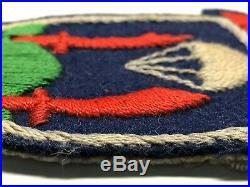 KOREAN WAR, UNPKF, UNITED NATIONS PARTISAN FORCES KOREA, JAPANESE MADE, VINTAGE, 10th SPECIAL FORCES GROUP, CIRCA 1952. Embroidered on a blue wool base. This patch does glow under UV light. That does not mean that this patch is bad. UNPFK represented the United Nations Partisan Forces Korea. 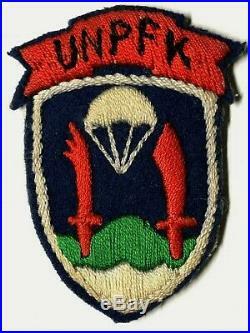 In 1952, the name was changed from UNPFK to United Nations Partisan Infantry Korea (UNPIK). The United Nations Partisan Infantry Korea (UNPIK), also known as the White Tigers, was a unit during the Korean War that was consolidated under the control of Eighth United States Army, Korea's 8th Army G-3 Miscellaneous Group, 8086th and 8240th Army Unit. The details of the undercover operation were made public by the US Army in 1990. The unit worked deep inside North Korea to gather intelligence, conduct raids and sabotage, rescue POWs, recruit and lead guerrilla armies and create confusion in the enemy's rear. The island Wollaedo in the Yellow Sea was used as a base by pro-Southern partisans during the war. This position was regularly bombarded by Northern artillery on the mainland of Cape Changsan. In 1952, a group of partisans working together with UNPIK landed on the cape. They successfully took control of and destroyed the artillery site, escaping with small losses. UNPIK was disbanded in 1954. 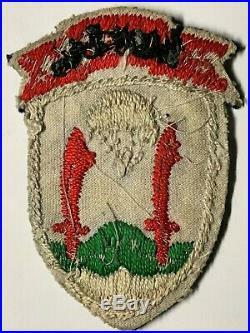 The UNPIK patch was worn by members of the United Nations Partisan Infantry Korea, 8240th Army Unit during the Korean War. UNPIK, 8240th Army Unit, were supported and trained by members of the then newly established 10th Special Forces Group. 10th SFG, formed in 1952, was the first permanent unconventional warfare unit, since World War II and was formed at Fort Bragg. Soldiers from 10th SFG were deployed to Korea and supported the ranks of the 8240th Army Unit. The 8240th was divided into two sub-elements. Combined Command for Reconnaissance Activities, Korea, 8240th Army Unit, who over saw intelligence gathering, and United Nations Partisan Forces Korea, 8240th Army Unit, which trained anti-Communist North Korean partisans. 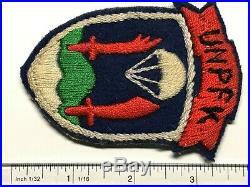 In 1952, UNPFK, 8240th Army Unit, was renamed UNPIK, 8240th Army Unit. The organizational and name changes to this unit, over less than three years, were a reflection of the shifting responsibilities for UW, during a time when a more permanent place was being created for this capability within the U. 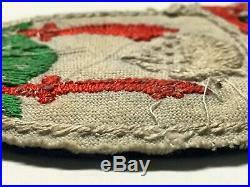 Among the men who wore these patches were the first U. The UNPIK officially deactivated and disbanded 1954. At the onset of the Korean War, which began with the North Korean invasion of the South in June 1950, the US Army had no "Special Forces" as we do today that were trained to conduct unconventional or guerilla warfare behind enemy lines, but the need quickly arose. Army learned it had "large anti-communist partisan forces" that had escaped North Korea and had set up ad-hoc bases on islands off the coast and were conducting limited operations into their homelands in North Korea, so the Army quickly assigned US advisors to support, equip, and train these partisans. These US advisors included Army Rangers, and 10th Special Forces personnel who had guerrilla warfare experience from WWII, and personnel who could think "outside the box" and operate in austere conditions with limited support. The Partisan forces grew in strength to approximately 38,000 by the end of the war and had a significant impact on the outcome [It is estimated that it took approximately two divisions of Chinese Communist and North Korean forces to provide rear-area security against partisan operations]. The number of advisors grew as well to support and advise the growing number of partisans. Special Forces as we know it today began in mid-1952, and in early 1953, approximately 90 officers and men from the second graduating class of the new SF school arrived to support these partisans operations. Most of these partisans were not soldiers - they were local government officials, school teachers, policemen, skilled laborers, etc. Most were from North Korea but did not support communism, so they escaped North Korea either before or after the invasion. When communist rule sweeps through an area that was considered dissident, it is not very kind to the populace. Several of the partisan supporters were female as well. Many partisans did not make it back from their high-risk missions behind enemy lines - they had one of the highest casualty rates of any unit during the war. Some patrols were simply never heard of again after insertion. There are only about 2,500 known survivors remaining today, with another estimated 500 survivors that have chosen to remain anonymous. And because they fought as "partisans" under UN/US control, and not as South Korean soldiers, they were not recognized by their own government as fully-fledged veterans. They only received about 1/3 of the benefits as other Korean veterans did. The US Congress recognized them this decade thanks to the hard work of some caring US veterans, and the South Korean government finally recognized them in 2008 with full veteran benefits, of which a percentage can be passed onto their children. There is a good reference book out there, which I encourage you to read. White Tigers: My Secret War in North Korea, by Col. Malcom with Ron Martz, foreword by Gen. McLean, VA: 1996, 288 pp. Ben Malcom's memoir of the Korean War is both interesting and amusing. Detailing his experiences as an intelligence officer assigned to the United Nations Partisan Infantry Korea (UNPIK) Group, Malcom has the distinction of leading numerous covert operations deep inside North Korea. When Malcom arrived in Korea as a First Lieutenant in February 1952, enroute to join the 3rd Infantry Division, his orders changed when the 8240th Army Unit recruited him into their service. At this point in the war the U. Army had been driven back behind the 38th parallel. The 8240th Army Unit, headquartered in Seoul, was run by Colonel Jay Vanderpool, a guerrilla operations veteran in the Philippines during World War II. In 1947 Vanderpool served as the Army liaison to the Central Intelligence Group (forerunner to the CIA). In 1950 the Army loaned Vanderpool to the newly created CIA to resolve the dispute over North Korean troop estimates. Vanderpool's estimates were wrong, citing a figure of 35,000 NKPA troops when the actual number was 136,000. Vanderpool was returning to the U. When North Korea attacked the South. Vanderpool briefed Malcom on the overall mission objective: the establishment of bases on offshore islands where partisans could be trained in intelligence gathering, communications, demolitions, and basic infantry tactics. From islands, using fishing junks as disguise, partisans infiltrated inland on both intelligence and combat missions. The fishing junks were modified with modern engines, machine guns, and communications gear. Malcom was assigned to Leopard Base, located on the island of Paengnyong-do, on the west coast about 125 miles north of the front lines. Leopard was responsible for everything west of the Ongjin Peninsula and north to the Yalu River. There were eleven partisan units operating from the island. Designated as "Donkey Units, " the origin came from a speech delivered by the first commander of Leopard in which he used the analogy of a wise mule that does not panic in barbed wire, but patiently waits for an escape. Malcom changed the name of his favorite D4 to "White Tigers" for their unusual courage under fire. The partisans were quite clever in combat. One favorite trick was to fake NKPA operational orders. One partisan unit planted mines on a hill, then printed fake NKPA orders to attack. The NKPA troops stormed the hill killing eighty of their own men. On another raid they found North Korean war bonds and new one-hundred-won notes. These were sent back to Seoul to be counterfeited and reintroduced into enemy territory. One operation Malcom planned and participated was the destruction of a 76 mm gun overlooking Wollae-do. After the completion of the mission, NKPA radio broadcasts began discussing him by name and his operational role at Leopard Base. A price on his head was mentioned to encourage assassination. Obviously, a NKPA agent had infiltrated Leopard. Partisans were drawn from refugees and NKPA deserters making it difficult to weed out agents. The Leopard Base mission was an unusual hybrid of combat operations and intelligence gathering. Intelligence was secondary to combat despite Leopard's success rate of deep penetration agents. Kidnapping was a simple matter. When Seoul needed a NKPA officer, partisans would dress in NKPA uniforms with fake arrest orders and walk into a NKPA compound and arrest one of the officers. Malcom discounts a popular myth that reappears during each new war. It goes like this, a partisan leader infuriated by an American officers constant badgering about enemy casualty figures finally throws a bag of ears on his desk and walks away in disgust. Leopard Base became famous for such a story, but is was too similar to a legend out of Burma with the OSS and Kachin rebels, and later reappeared during Vietnam with the CIA and the Montagnards. Malcom received the Silver Star for bravery, but due to the classified nature of his mission did not receive the Combat Infantry Badge (CIB) till a petition granted it to him twelve years later. White Tigers is rich in detail and fascinating in scope. Secrecy often intrudes into documenting history, but fortunately Malcom's book helps lift the veil to expose a fresh look on the Korean War. Review was by Wendell Minnick, 1997. And for more reading and research. The item "KOREAN WAR, UNPKF, UNITED NATIONS PARTISAN FORCES KOREA, JAPANESE MADE, VINTAGE" is in sale since Monday, April 1, 2019. This item is in the category "Collectibles\Militaria\Korea (1950-53)\Original Period Items". The seller is "bayern-landhaus" and is located in Fort Knox, Kentucky.